F-14 is the system 11 game that I most often have to replace transistors in the special solenoid section and the weird part about it is that the diverters are computer controlled and thus not prone to locking on from a stuck switch like the slings and pops. After repairing 1 or the both of these diverter coils on literally over a dozen machines I finally noticed that the diverters are usually wired to the purple and yellow 50 Volt coil circuit. Now what's odd about wiring them to the 50V circuit is that they do this without any intermediary device between the 50V at the coil and the TIP102 on the board. Originally at the time Williams would use a snubber relay board to activate 50V coils. They would use the TIP102 to drive the 24 Volt relay and that relay would connect the coil to the 50V circuit. Later they used little boards that had TIP36 transistors on them in place of the relays and finally put those transistors onto the AUX driver board. Later on WPC system they did drive 50V coils directly from TIP102's. 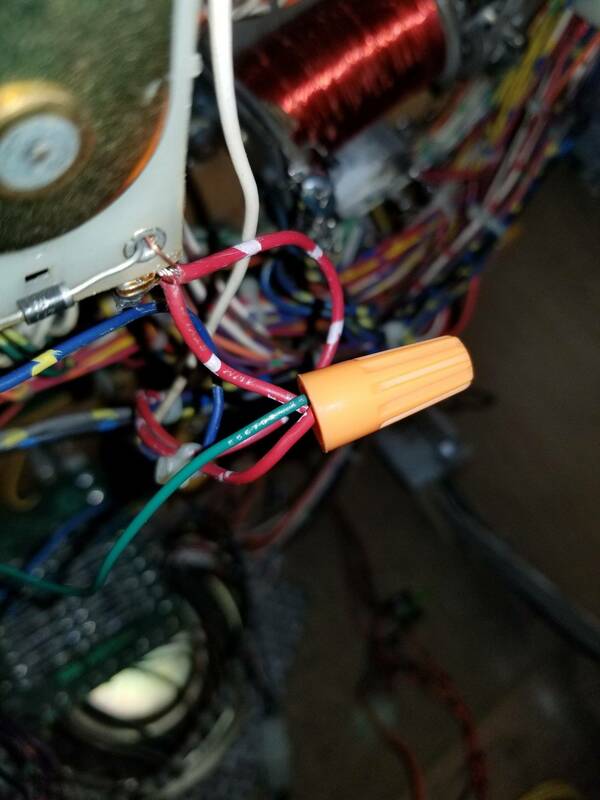 I had debated whether to switch that 50V source at the fuse holder under the playfield to 25V and this might prevent the coils from melting and blowing the TIP102 transitors. Then I ended up with a Sample F-14 and found that those coils on that game were wired to the 25V red/white source. Same mech, same value coils. The game works fine and the diverter arms did not appear to get pushed out of the way when the ball hits them, so I'm not sure why the change occurred at the factory and at which point during the run they did it. This game is what made me seek out a fix to the achilles heel of the system 11 board set and I've seen 2 different approaches, individual coil fuses and a one shot input board. So long story short I believe that changing the coil voltage on the diverters on F-14 from 50V to 25 should help prevent the game from burning up those transistors randomly. I disconnect the purple wire and run a red wire to the the pop bumper, then I add a 1 amp fuse to each coil wire and lastly I replace the tip122s to tip102s. Never had another issue after this. I will have to try this. It seems that 30 percent of my home calls on f14s are related to divertor coil and or circuitry failure. I know the cause can be a weak shooter spring. Kids in the home attempt to shoot the ball and it rolls back to the shooter. When this repeats over and over the transistor will heat up and often lock on. The diverter coils hold and cycle based on closing and opening of the switch(s) in the shooter lane. I could see a situation where the shooter lane and other switches dont work that leave the diverters on for extended periods of time while the ball is in play. I am going to have to open up my F-14 and check 50v/25v. In my F14 had one diverter burn up in the 10 years I owned it and there is evidence it got worked on before that. Nice catch. I'll have to check again next time I'm in front of one. I think there's a switch on the shooter lane wireform about halfway up. grumpy - Can you elaborate on this a bit as I think I might want to do this to my F-14 to bullet proof it? why remove the purple wire and run a red wire from the pop bumper (Is it a better ground or power source or something?) I think adding the 1 amp fuse to each coil wire seems like a good idea as well (Dumb question slow blow or fast blow?) Also why change the 122's to 102? I assume it has something to do with handling voltage better but I'm just not 100%. Also would there be any value in only adding one 1 amp fuse to each wire going to the coil? Also do you do this for both divertors? Thanks! TIP102 can handle more current than tip122. I just changed my f14 diverters to 25v and took a couple pictures. Used wire nuts because I'm lazy and didn't heat up the solder wand. Purple white all four leads got wire nut together so not to break the chain. Red white picked up near the pop and ran it over to the diverters. I used a green wire to match the hack wire already on the coils and I had no red white. I actually had trouble with the top diverter plunger not pulling in all the way but the compression spring was really stiff. I clipped it in half and reattached. Now the diverters work fine on 25v. I think pinballplus is onto how you kill the transistors. Half plunging up the shooter lane enough to close the switch up there cycles the diverters potentially forever and they hold for 5s max or so each time. If you continously half plunge the driver transistor and coil both start really heating up. Software programming to force no diverter action after so many half plunges but then open up possibility of scoring / m ball steal exploit. The diverters have a dedicated fuse (a single fuse they both share though which should be OK as I don't think they are even supposed to fire at the same time) . 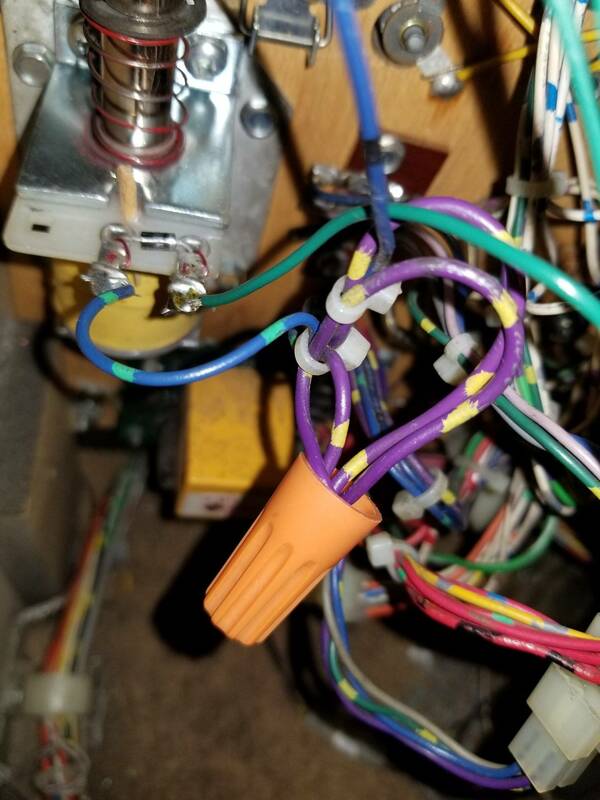 If you look in the upper right corner of the bottom of the playfield (lower right when the pf is tilted up), the purple/yellow wires connect to a fuse holder somewhere beyond the upper right flipper. This would be the ideal spot to jumper to the 25V coil power, on the feed side of the fuse as I believe only the 2 diverters are fed from this fuse. The purple wire has 50 volts on it. The red wire on the pop bumper has 25 volts on it. A Tip 102 is about 60% stronger than the Tip122. So if reduce the voltage by half and use a more robust transistor you fixed the issue. Also you add one fuse for each coil to minimize board damage if something should go wrong. One amp slow blow works. both diverter coils where melted when I got it. Yesterday I changed them out and in testing they worked briefly then melted... had banded side of diode on power lug so dont think that was the issue... think it has something to do with the pre-driver transistors? planning on testing those when I get home. ordered new coils but dont want to make another mistake and melt more money away. Should I piggy back the power off the pop and try that? dont want to make another mistake and melt more money away. This has been talked about before in the F-14 Tomcat owners Club. Check out posts 3235. Hey Grumpy, any way to modify the pin to prevent this from happening ? You can install a inline fuse for each of the diverter coils on the power wire, 1 amp slow blow fuse. You can add snubber relays for the coils to remove all the stress from the transistor and place it on the relay. You can add a high current driver (TIP 36c) for each coil, this is a higher wattage transistor to take the place of the snubber relay. And the last thing you can do is to remove the high voltage (75 volts) from the two coils and wire them with low voltage (32 volts) from the pop bumper coil. You only need to do one of the last three items, After this it will never melt down again. Switches on either side of it on the matrix work so I'm hoping it's just a wire under the ramp that broke. The switches in a row or a column in the switch matrix do not follow any kind of order. The factory wired them which ever way saved them the most wire. What you need to check is if all the rest in a row or a column work, if you find another switch that doesn't work it will help you pin point a location for the broken wire. Also it can still be a bad diode or switch too. interesting, thanks for the tip! I will check more on my lunch break hopefully (have an hour lunch and work about 5 min from my house). I dont have a working display right now and am missing some sounds (mainly background music) so its hard to test some of them that if i cant hear a sound or if it doesnt light up an insert, but everything I can test that makes a sound or lights up an insert is working.